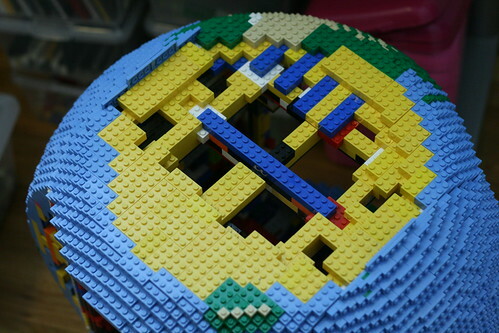 I play LEGO a lot with my daughter, and I’ve been obsessed with making spheres. 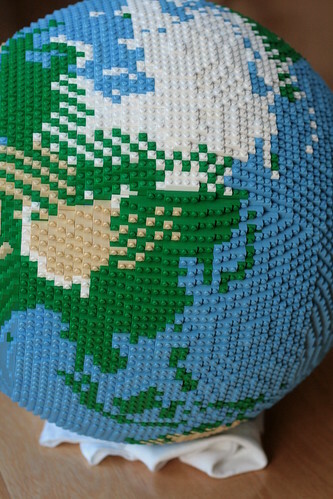 My last sphere building attempt was building a mini LEGO Earth in 2009. While I enjoyed the project, it was also clear to me that there is a room for improvements. The main issue is that the the “pixel resolution” of LEGO is rather low that many of the distinctice coast line shapes are just not visible. I also later discovered off-by-one bug in the program that I used to compute the color assignment to tiles, which skewed the projection around seams. So around March last year, I decided to build a bigger version of it, at the whopping 3x scale of the earlier project. This will surely give me enough resolution! 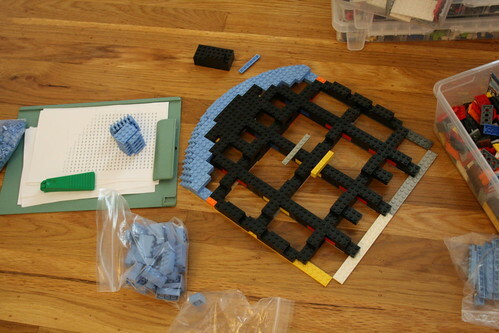 The construction starts with building a 36x36x36 stud cube from LEGO technic beams. The studs are facing all 6 directions. 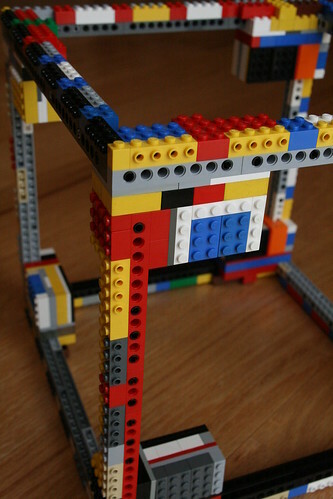 The lumps at corners are for changing the stud direction as well as for supporting the structure. One thing I wasn’t too careful about in the planning phase was the seasonal change of the Earth surface. On the positive side, the higher resolution really paid off. Here are two Earths side by side, showing the same side. This version of Earth is about one meter across. It’s quite heavy, but I can still carry it by myself. 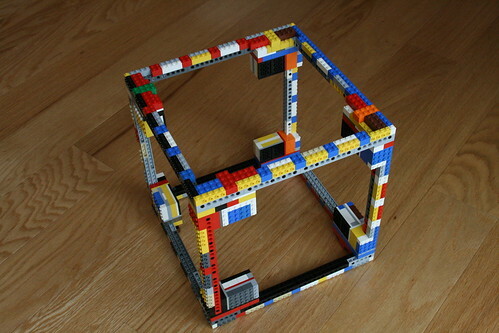 Once I assembled it, I still had some more fun by calculating various numbers based on this scale. For example, the highest point of the Earth, Mount Everest in Himalayas, is only about 0.3mm tall above the sea level. 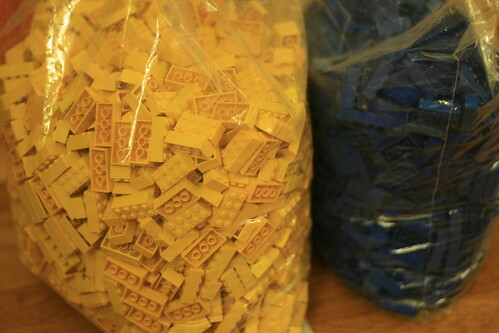 That is, it’s not even one tenth of a LEGO plate high. 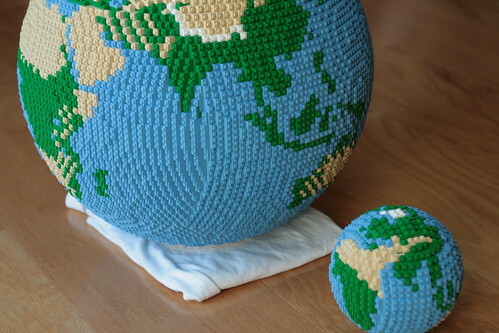 In fact, he whole Earth crust is only about 30km deep, so that’s only a half LEGO plate high. 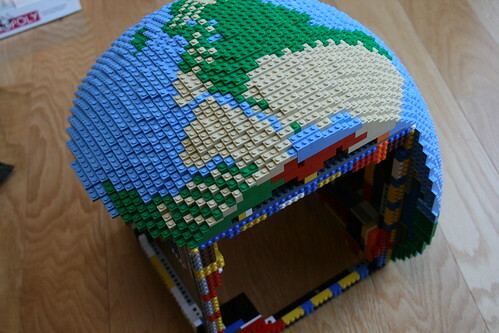 If I wanted to correctly model the interior of the LEGO Earth, then I have to basically build a red sphere all the way, except the top-most plates. It’s almost like we are living on the egg shell, and no wonder the continents moves over time! In the same scale, the Sun would be about 50m (200ft) in diameter at 6km / 4miles away. That’s big enough to comfortably fits the Statue of Liberty inside. 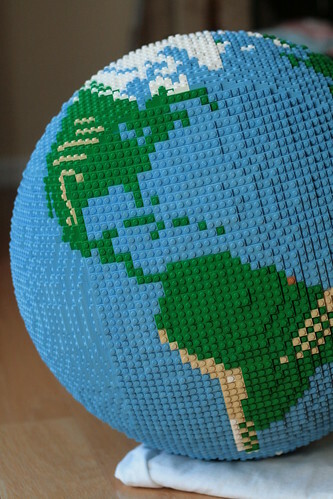 Someone please build that in LEGO and we will put that and my Earth together at the accurate distance! Finally, if you put this Earth in my home at San Jose, the furthest man-made object, Voyager 1, is past San Diego and into Mexico, flying at the speed of 1.5m/h. Picture a garden snail that crawls past the LEGO earth, slow that down 100 times, and that’s about the speed of Voyager 1. No wonder it took 35 years to get there — go Voyager! Anyway, that’s it. Now that I’m finished with this project, what am I going to build next?